Boro teenagerBilal Brahimi has been linked with Liverpool and Newcastle. It may seem a strange time for transfer rumours, yet Middlesbrough's name has cropped up a number of times in the last 24 hours. We take a look at some of the stories which have been circling the web in the last few days, which have linked players with moves to and away from the Riverside. French teenager Bilal Brahimi is a man in demand after impressing for Boro's youth team this campaign. The 19-year-old forward joined Boro in 2017 from Portuguese side Leixoes and has played regularly in Premier League 2, Division 2 this season. Brahimi, a France Under-19 international, also made his senior debut against Rochdale in the Carabao Cup earlier this campaign, and his progress has alerted multiple Premier League clubs. According to TeamTalk, Liverpool and Newcastle are both keen on the player, with Ligue 1 side Rennes currently in pole position to sign the teenager. Boro were heavily linked with QPR's Luke Freeman in the summer, yet the forward elected to stay at Loftus Road. Freeman has been a key player for Rangers this campaign and is the club's joint top scorer with eight goals in all competitions this term. 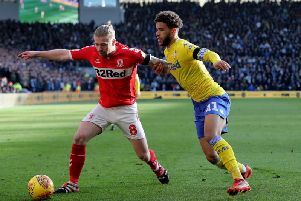 Yet according to London.football, Boro remain interested in the 26-year-old after seeing an offer knocked back in August. Leeds boss Marcelo Bielsa is also said to be keen, after Freeman scored the only goal of the game when QPR beat the Whites last months. Brentford striker Neal Maupay was also linked with Boro earlier this year, with Aston Villa also reportedly keen. The Frenchman, 22, has scored 23 goals in 41 appearances in all competitions this term, including 20 goals in the Championship. Maupay hasn't scored in his last three games but relished the challenge of playing against a promotion-chasing West Brom side on Saturday. When asked if he thought he was good enough to play against Premier League defenders, Maupay told London.football: “Yeah, I think I’m good enough to play against those kinds of players. I work hard every day in training, try to improve every day. So we will see."